Celestron 21035 70mm Travel Scope Review - Get a Better One! Celestron’s Travelscope 70 is yet another example of Celestron using their brand name, reputation, and clever marketing to unload a glorified toy telescope onto buyers. This scope, however, is a unique twist on those, as it is sold as both an astronomical telescope and a terrestrial/spotting scope. It is more or less a failure at both. The Travelscope 70 promises that for under $100, you’ll get a good refracting telescope on a good mount – with the bonus of fitting in a backpack. 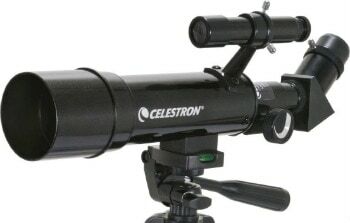 Problem is, either just a good mount or 70mm refracting telescope optical tube by itself would be $100 or more, so Celestron is trying to deliver the impossible here. The TravelScope 70 is a 70mm f/5.7 achromatic refractor. Due to this short focal ratio, the scope displays a lot of chromatic aberration (false color) on bright objects – in fact, more than it should. Celestron cheaped out big time on the objective lens and it seems to use rather low-quality glass and be manufactured to rather poor standards. The scope also struggles to deliver sharp images at 40x – I’ve had good 50mm scopes that do well at twice that magnification! Even the cheapest, wobbliest, most plasticky refractors I’ve ever looked through have had a decent objective lens – and the Travelscope 70 fails at even this. The lens has only a single-layer coating, so between this and the crappy optical quality it loses a fair amount of light compared to even moderately more expensive refractors. The tube is aluminum, but the focuser isn’t – it’s plastic, and wobbles. The scope’s plastic dew shield is so short that it’s practically useless, and the inside of both it and the tube are shiny, causing glare and reflection problems. The tube also seems to have little, if any, internal baffling to stop glare and reflections. The bottom of the tube has an extremely short Vixen-style dovetail with a ¼ 20 threaded hole, so in theory it can be mounted on a real astronomical mount (which will dwarf it) or any photo tripod. People seem to like using it as a birding/range scope when mounted on a good photo tripod, but even at its price point there are far better options for this than the TravelScope 70. How Good Are The Accessories? The scope’s finder is a plastic 5×24. These 5x24s have a singlet(!) objective lens, an aperture stop to control the resulting aberrations that makes the image unusably dim, and an eyepiece with a drinking-straw like field of view. 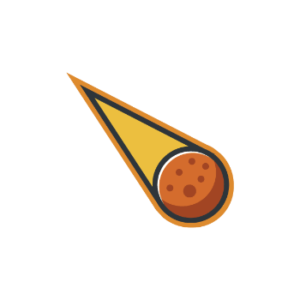 It is less effective than those toy pirate telescopes made for little kids. Not only is the finder useless, but it’s also completely pointless, as the scope’s wide field at low power means it doesn’t really even need a finder. It basically is its own finder. The included 45-degree erecting diagonal is not only uncomfortable to use for an astronomical telescope, but also extremely low in quality. The entire body and housing is plastic, as is the barrel for inserting it into the focuser drawtube. I’ve seen good diagonals with plastic parts (the prism is what counts, after all), but this one isn’t it. The Travelscope 70 comes with 20mm and 10mm Kellner eyepieces. The construction of both is largely metal, the field of view decent and the images reasonably sharp, although not as good as a decent Plossl or wide-field eyepiece. The 20mm Kellner provides a little too much power for the scope for low-power sweeping while the 10mm, though decent in quality, provides too much magnification for the scope’s mediocre optics. Of all the nasty issues of the Travelscope 70, the one that plagues it the most is the mount. The mount lacks slow motion controls, for one. With a longer focal length telescope I’d probably have more to complain, but the Travelscope 70 is designed to be a rich-field sweeper used at low power. The mount for the Travelscope 70 is little more than a dinky, mostly plastic camera tripod sold for small digital cameras and the like. It suffers from balance problems depending on where the scope is pointed in altitude, but the more serious problem is just how undersized it is. With the legs fully retracted (and thus only suitable for use on a table), it’s not the steadiest. With the legs extended, the tripod has the stability of cooked spaghetti and vibrates noticeably to the untrained eye, with distractingly shaky images at even the lowest magnifications. To summarize this review of Celestron Travel Scope 70, with bad optics, glare problems, plastic abound, and a tripod that holds itself up about as well as a wet noodle, I simply cannot recommend the Travelscope 70 for any purpose other than terrestrial spotting – which there are much better telescopes for both around and above its price.